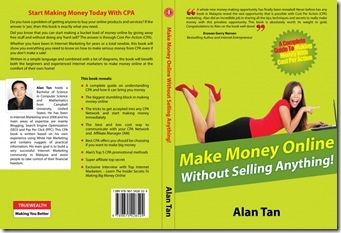 You are invited to my Cost Per Action(CPA) Book Launch on 23th April 2011 (Saturday) at the Putra World Trade Centre, Kuala Lumpur. It was held during KL International Book Fair 2011 as well. So bring along and tell your family, friends and acquaintances and have fun. You can get a special book discount price for all purchased. Book Talk on "Make Money Online Without Selling Anything!" by Alan Tan at MPH Megastore One Utama – 12 March 2011. If you want to know more about me and my book, this is your opportunity to meet me personally. You can ask me questions, talk to me, get my autographs and even take your photos with me! So turn up with your colleagues, family and friends, and we’ll make it a big party! And yes, you might even learn a few new things! Time : 3 p.m. – 4 p.m. This entry was posted on Thursday, April 21st, 2011 at 9:29 am	and is filed under Make Money. You can follow any responses to this entry through the RSS 2.0 feed. Both comments and pings are currently closed. Congratulation on your new book. I have attended Azizi Ali seminar on how to write a best seller in 88 days and hope to come out with a hard copy book soon.